The European Commission foresees five possible scenarios for Europe by 2025: to carry on as usual; function as a single market only. 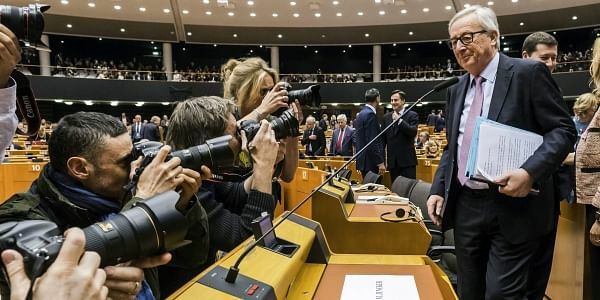 BRUSSELS: The European Union's executive arm unveiled new ideas Wednesday to keep the bloc unified as Britain prepares to leave and far-right extremism casts a shadow over the EU project. The European Commission foresees five possible scenarios for Europe by 2025: to carry on as usual; function as a single market only; do less but be more efficient; allow groups of member states to advance at their own pace; or do far more together. European Commission President Jean-Claude Juncker wants EU leaders to discuss the so-called White Paper at their summit in Brussels on March 9-10. EU citizens and non-governmental organizations are also invited to comment. "It is the start of a process, not the end, and I hope that now an honest and wide-ranging debate will take place," Juncker said. The move comes with Britain set to launch by the end of March a procedure likely to result in its EU exit in early 2019. No member has ever left the bloc before, and the prospect of losing Britain has shaken a Europe already coping with a refugee emergency and extremist attacks. French far-right leader Marine Le Pen is threatening to follow Britain's lead if she wins the presidential election in May. The party of anti-Islam firebrand Geert Wilders is also set to poll well in the Netherlands' election in two weeks. Juncker said debate on the future should focus on what Europe can — and cannot — do. "We shouldn't (try to) persuade people that we can simply conjure up the sun and the moon," he told EU lawmakers. He noted in particular that EU institutions alone cannot fix problems such as rampant youth unemployment. "We cannot produce miracles if national measures do not do enough," Juncker said. In a joint statement, the foreign ministers of Germany and France said the commission's ideas are "an important and valuable contribution" to the debate. "In view of the enormous challenges Europe faces, we must not ratchet down our ambitions for the common European project," Germany's Sigmar Gabriel and France's Jean-Marc Ayrault said. Commission officials said none of the five scenarios is preferred and that a combination of several or another approach entirely might be possible, even likely. Juncker said later Wednesday that he thinks none of the five ideas "will ultimately be the final option. There will probably be a sixth option." Three of the scenarios potentially pose challenges to policymakers. Carrying on as if Britain's vote to abandon the EU was meaningless would send a damning message to a public already deeply skeptical about the European enterprise. But scaling back to a single-market trading entity could make it harder for people to cross borders or work abroad. Juncker himself said that he rules out "the European Union sinking to the level of a free-trade zone." Many also oppose letting the EU do too much, which could concentrate more power in the hands of unelected officials in Brussels and raise the specter of a federal European super-state. Some moves might require changes to the EU's founding treaties, a series of constitution-like texts that have been painstakingly drawn up over the years and would require consensus to modify.